The iPhone is an iconic device and a significant number of customers will not use any other phone. Sprint's Virgin Mobile was one of the first US prepaid operators to sell iPhones to customers, beginning with the iPhone 4 and 4s which launched on Virgin in June of 2012. 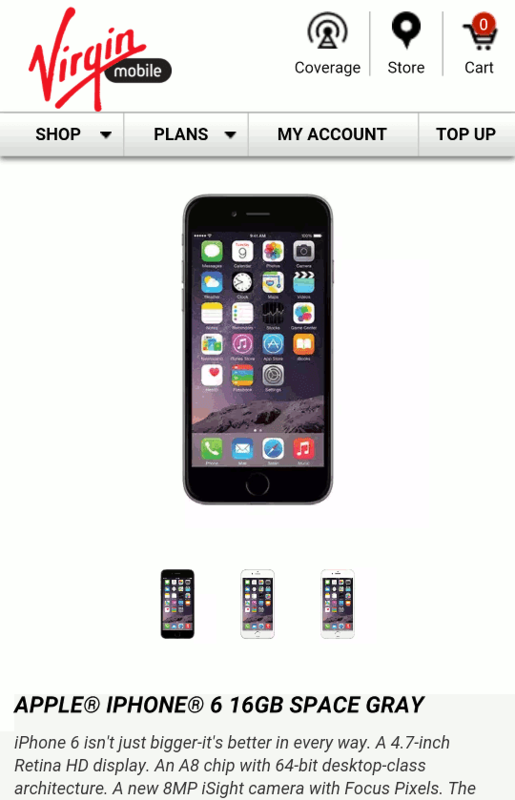 Eventually Virgin got the iPhone 5, 5s and 5c as well. 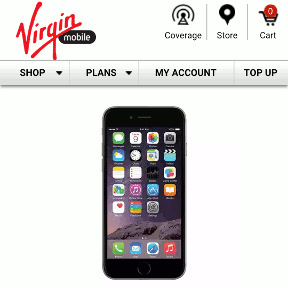 From June, 2012 through Sept, 2014 one or more iPhone models were always available on the Virgin site and from Virgin Mobile dealers. Then last fall the iPhones started listing as out of stock on the Virgin site and by February of this year they disappeared entirely. Virgin Mobile's iPhone prices are substantially lower than Apple's full retail prices of $450 for the iPhone 5c, $649 for the iPhone 6 and $749 for the 6 Plus. $20/month: 300 minutes, unlimited texts, no data. $35/month: unlimited voice minutes, texts and data with the first 250 MB of data at full speed. $35/month: 300 voice minutes, unlimited texts and data with the first 2.5 GB of data at full speed. $45/month: unlimited voice minutes, texts and data with the first 1 GB of data at full speed, plus unlimited international texts and 100 international minutes. $55/month: unlimited voice minutes, texts and data with the first 3 GB of data at full speed, plus unlimited international texts and 100 international minutes. There's a $5/month discount on $35 and higher plans for iPhone users who sign up for auto-pay. I wonder if the return of iPhone's signals a renewed interest in Virgin Mobile by Sprint. The Virgin Mobile brand has been looking a bit neglected of late with rate plans that are no loner very competitive and limited device choices. Back in the day, Virgin Mobile was an innovator and price leader in prepaid with firsts like some of the first prepaid smartphones and a $25/month unlimited prepaid data plan. Hopefully we will soon see Virgin return to it's former glory with more devices and better value plans. Yeswap I was in Walmart like 2 days ago and I saw 3gb 4glte 40 dollar unlimited Virgin plan not bad if you can deal with native Sprint coverage only. So, maybe plans have changed or they might be Walmart exclusive plans hmmmmm. Watching Sprint stock bleeding heavily in the last 3 months, and realistically their stock is still about 50% overvalued, it is my feeling that Sprint is all but doomed. I wont be surprised if they get chopped to pieces and the spoils go the the rest 3 carriers. Dennis, I've been happy with Sprint via VM with my LG Volt. However, I recently purchased an unlocked G2 and activated it on Cricket. If I activate that same G2 through Tracfone's byod will I get the same at&t network coverage? Would really like to keep both phones active but save some $ too. TracFone GSM coverage should be as good as Cricket's. I left Sprint about a year ago for Cricket because I was tired of the coverage issues. I carry my old VM phone for a day or two every few months and check out the "time without signal" metric to see how things are going. I was pleasantly surprised to see 0% in my most recent test this month! Maybe Softbank is turning things around. I'm tempted to jump on the Boost turncoat deal, but I can't justify purchasing another 1.2GHz quad core Snapdragon 4x0 processor. Sad there's no compelling upgrade over the 2013 Moto G I picked up for $50 AR. iPhone 5 and 6 do not support carrier aggregation now being deployed in major cities by Sprint. When iPhone 7 is announced, they will drop iPhone 5 and 6 for that reason. So they are unloading their inventory and purchase commitment. I believe that is what is happening. No, Virgin sold iPhones for $100 off in the past. They do it to hook customers. The iPhone 6 and 6+ just had a big Q2, and Apple is not clearing inventory. Sprint is moving iPhone 6 inventory very well with its leasing programs and there have been no reports that they are behind in their commitment to Apple. iPhone 7 is 14 months away and nobody but Apple knows what it will support. iPhone 6S arrives in 2 months and we don't know yet whether it supports carrier aggregation (or T-Mobile band 12). Good chance it will, but it's Apple's business case. The next model name is not announced - I'll take your guess that it will be 6S. Sprint and Apple jointly plan future models. Carrier aggregation is needed to match the features of other Sprint flagship phones. So yes, these are real factors in the life-cycle, distribution, and pricing of a model as it starts to show its age. That's all I am saying. Still no Virgin phones on Sprint but Virgin will now GSM unlock the iPhone 5c, 5s, 6 and 6 Plus after 12 months on Virgin. I'm not clear as to why yet, but my niece who has been on the $35 250MB plan just received notification via her phone that she has been given 1GB of data. I don't know if this is some sort of customer loyalty thing (which she said VM mentioned in the text message) or if they are getting ready to rework the $35 plan's data allotment. I'll be curious to see if this becomes permanent or is just a one time thing. I was with VM for years and never received a Loyal Customer bonus. Neither had she until today. In regards to my earlier post regarding my niece receiving a bigger data allotment, I forgot to mention that she does NOT have an iPhone. She has a discontinued HTC model. I think most people would be better off with Ptel than Virgin, price-wise. Compared to the $35/$30 Virgin plan with 250MB full speed data, Ptel charges only $20. 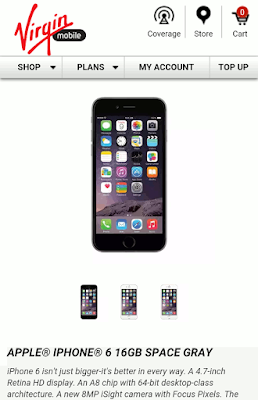 You break even in 10 months by paying full price for an iPhone 6. Same B/E comparing the $45/$40 plan to Ptel's $30 plan with 1GB. The Virgin $55/$50 plan ties the Ptel $50 plan with 3GB, so Virgin customers save $100 on the iPhone. Virgin doesn't match the Ptel $60 plan with 10GB.